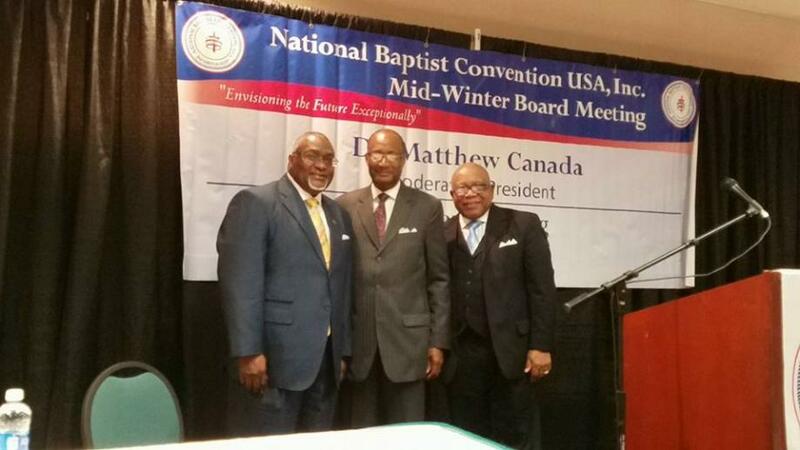 President of the Moderators, National Baptist Convention, USA, Inc.
Rev. William James Wyne, Jr., is a native of Birmingham, Alabama. He served as the Pastor of Missionary Union Baptist Church, Columbus, Mississippi from March 1980 to September 1991. He is presently the Pastor of the historical Second Missionary Baptist Church, Battle Creek, Michigan, which was established in 1849. Since assuming the leadership of the church in January 1999, Second’s New Vision and Outreach Ministries has been established (Community Development Corporation). The Outreach Ministries consists of the Reading Incentive Program (an After-School Tutorial Program – a collaboration with Battle Creek Public Elementary Schools), and A Second Chance, Two Transitional Houses for males or females (a collaboration with The Haven of Rest), The NorthSide Senior Meal Activity Program (A lunch program that feeds Seniors Tuesdays thru Thursday), The Annual Historical HBCU Concert since 2001. In the spring 2006, the congregation completed Phase I of the Family Life Center. Phase I includes administrative offices, classrooms, youth room, conference room, and an elevator to make the facility fully handicap accessible. Pastor Wyne completed his clinical residency in Clinical Pastoral Education (CPE) at Children’s Hospital of Detroit, Michigan, and is a Board Certified Chaplain by the Association of Professional Chaplains. He holds a theological degree from Bethany Bible College, Dothan, Alabama (BA in Ministry), Faith Lutheran Evangelical Seminary, Tacoma, Washington (MA in Christian Ministry). He has also done his post doctoral studies at (ETS Ecumenical Theological Seminary Detroit), and is in the candidacy stage at Trinity Theological Seminary. He is the Moderator and an instructor with the Chain Lake District Missionary Baptist Association. He also serves as the President of the Moderator's Division of the National Baptist Convention, U.S.A. Inc. Pastor Wyne is a leader of a Ministerial Leadership Group of Pastors in the American Baptist Churches of Michigan. Rev. Wyne is the founder and organizer of the MLK Community Ecumenical Service and served as a Trustee of Kalamazoo College. He is the recipient of numerous honors and awards that attest to his work. Pastor Wyne’s sermon, “A Faith for Life’s Fires,” was published in The African American Pulpit summer of 2003 issue. Rev. Wyne is married to Josie Howard-Wyne. They are the parents of two daughters, Lisa S. Stinson and Genesis L. Player and the proud grandparents to Makyla Grace Player. President Wyne states: "The focus of the Moderator's Auxiliary is to carry the vision cast by President Jerry Young into the Associations and the State Convention. Presently, the Moderators are responding to Dr. Young's request for supporting the Convention with a Disaster Relief offering. Associations from across the Country are being asked to give in support of this effort that hopefully becomes the seed for a Disaster Relief Fund in the National Baptist. Too often when the Convention has to respond to Disasters, it does so without specific funds designated as such. "The Moderator's Auxiliary also exists to provide guidance and materials to Moderator's and Association as it pertains to the work of a District Association. "The Moderator's Auxiliary is one of the several extensions to the parent Body that embraces and articulates the vision of the President of National Baptist." Convention President Jerry Young Appoints Dr. William J. Wyne, Jr. Moderator President at the 2017 Mid-Winter Board Meeting. NBC, USA, Inc. President Jerry Young announces the appointment of Rev. William J. Wyne, Jr. as the new President of the Moderators during the Januray 2017 Mid-Winter Board Session. Dr. Young and Rev. Wyne are joined by the outgoing President of the Moderators, Rev. Matthew Canada.